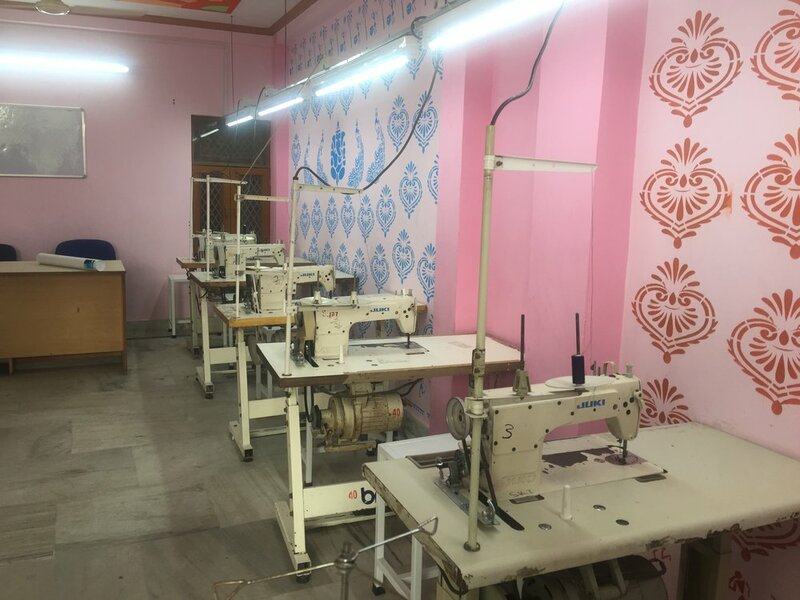 First Day in India: You won't believe this sewing space! We got in late last night, fumbled our way through customs, luggage and hiring a taxi to arrived at Ruchika’s doorstep happy to be in one place, take a shower and sleep lying down. I woke this morning to a million bird songs and wondered how they could make so much noise when I could only see two or three. The trees must be filled with them. I’m in India! After breakfast, we set out to see the new MoonCatcher sewing space. We took an UBER through crowded Delhi streets, weaving through treacherous traffic and 40 minutes later found ourselves on a small busy city lane filled with life. Maureen pointed out the beautifully dressed woman wearing a sari while mixing cement. Pretty impressive. Our new sewing guild is wonderful with its stenciled walls, huge windows and a balcony. There is plenty of space and light. It even has a bathroom! Our new home in Delhi. We moved some furniture, hung MoonCatcher banners and talked about where the cabinet and shelving should go. We sat and discussed training and work schedules and asked a million questions. I’m feeling pretty excited about this new venture. Ruchika deserves a medal for all the prep work she has done to make this transition so smooth. Ruchika and Ellie hang the MoonCatcher banner in our Delhi sewing center. Later in the afternoon we visited Ruchika’s brother-in-law and sister’s clothing factory. It was such fun for me to see this, having grown up in my Dad’s dress factory. It was about the same size too. We looked at everything and asked tons of questions. Our jaws dropped when we watched a beautiful, sari clad women hand sewing tiny beads to garments. The patience and attention to detail was sobering. The factory generously gave us some fabrics, threads, tape measures and fleece. With these things we can start training some tailors tomorrow to make MoonCatcher kits. At the end of the day, in an effort to keep us up past 8:00 pm, Ruchika took us shopping. We loved the shelves and racks of brilliantly colored garments and the gauzy feel of scarves and saris. It helped us keep our eyes open but by 9:25 we were more than ready for bed. Only three days to go! I leave for India on Sunday and am finishing up last minute details like calling my children and making sure my little gifts of maple syrup are in Ziploc bags. All the MoonCatcher supplies are packed and my bags are weighed to be sure they aren’t more than 50 pounds. I even ironed a few dresses so that maybe I won’t look like I slept in my clothes. This is exciting. I’ve always wanted to go to India. I had a pen pal from Bombay (now Mumbai), named after the same Aunt that I was named after, and we corresponded for years. I no longer know where she is but am still fascinated by her country and am delighted to be bringing The MoonCatcher Project there. I am curious to meet girls from India and see what we can do to help employ some women and teach about menstruation. So, I’ll take pictures and plenty of notes and give you a day by day report of what we are up to. We are hoping to speak at the school of social work, meet Phoebe’s friend who lives in Delhi and is interested in the project, go to three schools, teach how to make our kit and source materials. Maureen, my favorite traveling companion, will be with me and together we’ll hit the ground running in order to accomplish all the many tasks that we’ve been talking about for the last seven months. Luckily, we will have our new friend Ruchika (from Delhi but lives here in the US) with us to guide us through this process. Ruchika is in India now making sure everything is underway so that we can make the best use of our time. I can’t imagine what we would do without her. Keep us in your thoughts. We can use all that good energy while we do this work. MoonCatcher Kits all packed for India. I’ve come out to my childhood home. I meant to mow the lawn and weed the garden but almost the minute I got here it started to rain. I quickly picked a few veggies and have come indoors to write and make a garden dinner for myself. I’ve been talking with Devon and Charlotte from the MoonCycle Bakery, a wonderful business out of Olympia Washington that makes and ships beautiful healthy confections that arrive just in time for your period. They sell to those of us past that also, but the main idea is to provide menstruating women with healthy, yummy, naturally sweet goodies for that time of the month when women really crave that sort of thing.Check out their website: www.mooncyclebakery.com. Devon and Charlotte and I have been brainstorming about how our two organizations can partner with each other. The Giving Circle in Saratoga Springs New York carried back a large duffel bag filled with Ugandan baskets for us to sell. There are 38 gorgeous handmade pieces that will help us raise money for more pads for more girls. We’ll bring those to the September party too. Our sewing guilds in Uganda, Kenya and Malawi are producing hundreds of kits and bringing them to school girls along with our curriculum. Phoebe [from Uganda] tells us that nearly 4,000 kits have been produced in Uganda so far this year. Phoebe also just sent photos of the new batch of soap that will be added to as many kits as possible. Soap produced by the MoonCatcher Soap-Making Cooperative in Wakiso, Uganda. We are writing grant applications and gearing up for our Fall fundraisers. We have quite a few MoonBees scheduled and several presentations on the calendar. We are getting more and more organized for India and I’m getting excited about the possibilities there. Maureen, Ruchika and I met for a brainstorming session at Tower Hill Gardens in Boylston, MA. We now have a pretty good idea of what we want to accomplish in India and how to go about setting up our sewing guild there. Join us on September 21 to learn all about our plans for establishing cooperatives in India! I went to Malawi last month with the Mooncatcher Project (mooncatcher.org). While visiting a school, an English teacher begged me for books. I had delivered books to an orphanage before visiting the school, and had none left. These kids are taught to read and write English, but they don’t have any books to read for fun. I’ve been meaning to start writing a MoonCatcher blog from home and now, as I sit in the airport in Newark, waiting for a flight to visit my best friend Dawn in Portland, I’m writing my first “at home” piece. I’ll try to do this once a month or so, in order to give an account of what the MoonCatcher Project is up to from my own personal view. Or, I’ll just write some stories of day to day stuff that happens in this organization. For example, I was recently invited to dinner by Rotarian friends of mine. They wanted to catch up after their trip to Pakistan and to talk about The MoonCatcher Project. They had taken a few kits with them and had given them to some girls. Their friends from Pakistan were visiting and I had a chance to talk with this lovely family about what it’s like in Pakistan when a girl gets her period. The really cool thing was that the teenage daughters were happy to answer my questions. It’s always mind blowing for me to hear about other cultures around this issue. In Pakistan girls are told not to wash, at all, during this time and they avoid certain foods like eggs and nuts. Mostly the onset of Menstruation is a scary surprise. The girls I spoke to knew what to expect because their mother is a family practice doctor and the whole family is open and educated. Generally, it’s just not common practice to talk about menstruation. The MoonCatcher Project will be going to India this fall! I’ve thought of India before and have even sent some pads there but I figured we’d wait for a while before we did anything “big” there. Then the universe took over. I met a wonderful, powerhouse of a woman named Ruchika from Delhi, India now living here in the Capital District. Ruchika has convinced me that the time is right for us to bring MCP to India. She is working tirelessly to prepare for our October trip. Our plan is to establish one, or possibly two, sewing cooperatives in the Delhi area. I will keep you all posted! I’m back in DC. My sister picked me up from the airport this morning and we’ve spent a lovely day together. We got to see the paintings of the Obamas at the National Portrait museum. What an unexpected treat. Tomorrow she’ll drive us back to New York State where we’ll spend the night with my husband Michael and the following day go to Newville, the little village where we grew up. It was a good trip even with its frustrations and twists and turns. I’m learning that it’s best not to have expectations but as the MoonCatcher mantra reminds us, we must “go with the flow”. It’s not always easy for me since I’m used to making things happen in an organized, timely fashion. I’m beginning to understand that this doesn’t always happen, and sometimes better things take the place of my well thought out plans. We’ve left lots of schoolgirls with pads. We’ve trained twenty rural women to make our kit. We’ve worked with our old sewing guild and helped to improve their skills and the space where they are working. We taught 180 girls about their bodies and how to keep themselves safe and clean. 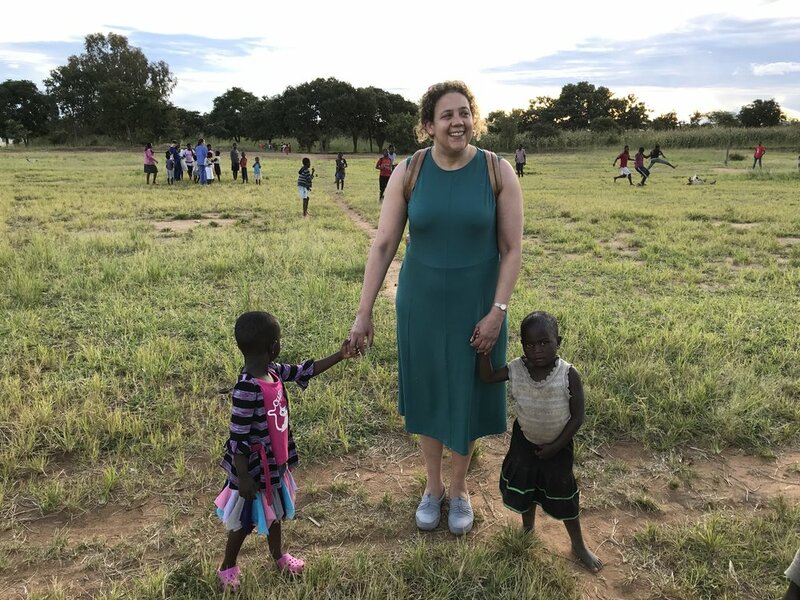 We found a most amazing young woman, Mary, to help us continue our work in Malawi and we sourced supplies that will make it possible to do this work. Thank God for Kelly and Lori. They were helpful, patient, kind and able to laugh just when that was the only thing to do. I am so grateful for their support and hope they will consider going again to beautiful Malawi. 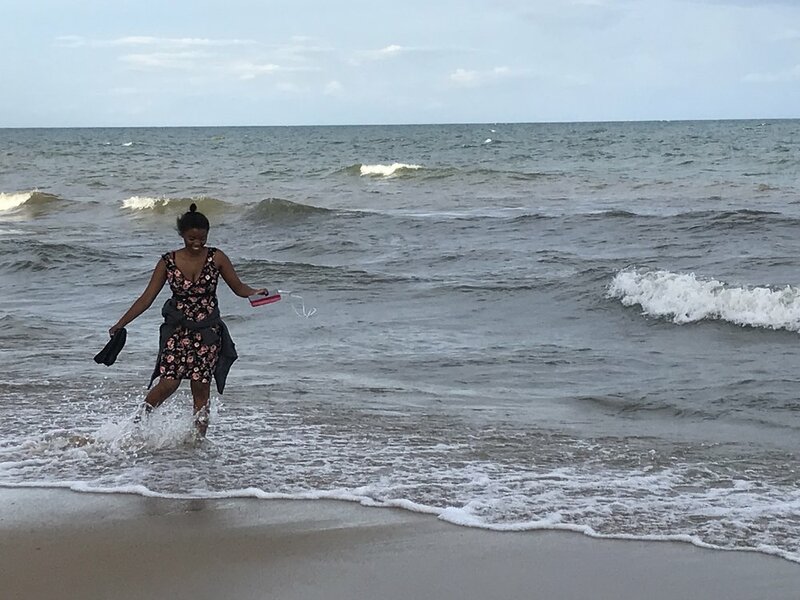 Our day at the beach! We drove all together in a large bus with enough seats for everyone. Yippee! It is often the small things in life that make me smile. We stopped in a small village with a tiny trading center to get cold drinks and snacks but mostly bought street foods like bananas, oranges, avocados and peanuts. Perfect lunch food for us today. Next, we stopped to buy crafts. A row of 20 or so huts held lots of bowls, statues, paintings, etc. I bought a few more things to sell at MoonBees and then hurried away from the overly insistent and somewhat annoying sales men who promised you could just “feast your eyes” but then delivered a sad story about how you were the only customer today and you just had to buy something from him. Oh dear, it’s hard to say no but also hard to hear it over and over. We arrived at the Red Zebra Hotel, changed into our swimming suits and left for the beach. I swear my temperature dropped ten degrees when I got into that water. It was very hot today so even though the water was nearly warm as bathwater, it felt refreshing and welcome. I went in and out several times, had beer with Kelly, scrambled around on the big rocks and all in all felt like I was on vacation for a few hours. Dinner with the gang, elephant necklaces from Brian and a walk to the end of the pier, ended this day. Off to bed. We start for home tomorrow. Today was great! After a typically long Malawi wait we set off for our day at Chamama Secondary School. I sat in the front seat, next to Brian (Dr. Brian Lisse), though I had remembered to take a Dramamine. I was fine the whole way even with the roads being all dirt and mighty bumpy. It was fun to catch up with Brian as we rode along. Even though we do these trips together we hardly see each other because of the nature of the work we do. You can find Brian in the hospital and me in the sewing room on the opposite side of the village. At the school we sat through numerous introductions, speeches, and skits. I was anxious to see the girls and start teaching them our curriculum but enjoyed the program that had been prepared for us. We squeezed 180 students into one classroom. Every bit of space was filled even with girls standing outside leaning in through the doorway. We had plenty of questions and answers and lots of laughing. It went really well. I think I was channeling Phoebe, our partner in Uganda who is the all-time pro at this. It went smoothly and we all had fun. The girls were delighted with their kits which of course made us feel wonderful. While sitting under the trees waiting for the computer teachers to finish their classes we were joined by about 12 of those girls who came to ask more questions and tell us things about themselves. In short, we had an impromptu focus group of very willing participants. What a lovely gift. We got back in the dark and walked Mary to the main road to catch a ride to her sister’s house. We all hugged and felt sad to be parting but so pleased that we’d made a new wonderful friend and partner for The MoonCatcher Project. Tomorrow we leave at 6:30 am for a jaunt to the beach, souvenir shopping and an overnight at a nice hotel right on the water. It will be fun to spend a day relaxing before flying home on Saturday. The moon tonight is crescent shaped just like a MoonCatcher pad. Perfect! It’s been a sunny, pretty day with blue skies and a gentle breeze. Kelly and Lori went off to a village with the rest of the crew today while I stayed back to receive the supplies from Emily, finish working with the tailors, facilitate the shelf building and get money to our cooperative. I was able to go through my suitcase and find various items that I had misplaced. I made beds, tidied up and felt more organized than I have since getting back from Chituka. Our supplies from Lilongwe arrived this morning and we were able to cut enough fleece to add to the kits that were missing these parts. I also had time to do a demo about how to cut carriers and hopefully that will help make things go better. I guess I had been worrying about seeing our stuff again so was relieved when I saw the car in the K2-Taso driveway. Thank you, Emily! I’ve felt good getting things tidied up and ready for tomorrow when we’ll all go to another village and distribute pads. We have 253 completed kits that we will be able to give to schoolgirls. It’s our last day of MoonCatcher work here and finally we’ll see some students. We’ll teach our curriculum and spend some time talking with the girls. The shelves are beautiful. Emmanuel, our carpenter, did a fine job and in a timely fashion. I was really pleased that they were completed exactly when he said they would be. I so wanted to arrange everything on them, but the varnish needs to dry so they won’t be ready until tomorrow. Oh well, they belong to the tailors so it’s theirs to decide how best to use them. We took plenty of photos of our little sewing group and said goodbye. Mary helped get all the pads up to Andy and Alice’s house so we are set for an early morning departure. Now I get to read for a while and wait for my pals and a nice dinner. We took it fairly slow today and didn’t get to the sewing guild until close to 9:00. Sophie and Esme were already there and Elizabeth came soon after. We spent the day organizing the space by sorting out goods from various cardboard boxes and continuing to fix pads that had been sewn incorrectly. I had a chance to show the women pictures from last year as well as photos from our recent trip up north. They asked questions and in general were delighted to see themselves in last year’s photos. Esme is picking up a charcoal iron tomorrow so that we can start to press some of the pads. I have mixed feelings about this after finding out that they start the charcoal with plastic bags. They feel that any kind of lighter fluid is too dangerous to store. I keep thinking about the fumes from the plastic being so toxic. This is a hard one to step back from and just say “this is the way they do it here.” I don’t know what the alternative is though. Mary holding our new charcoal iron. We met with Emmanuel, Elizabeth’s son, today about having shelves built for the sewing room. He has agreed to make 3 shelves that will be secured to the concrete walls with brackets and be 2 meters long by about 18” wide. I guess I just mixed measuring systems, but I don’t know the conversion of either. Emmanuel says he will be finished with the project by the end of tomorrow. That would be great as I am dying to get things up off the floor. Our supplies didn’t show up from Lilongwe, and Emily hasn’t gotten back to us about what will happen. I am trying to get them sent by bus tomorrow as I don’t want to wait until Thursday and have to worry about where they are. We were hoping to go to a village tomorrow and see a school but I’m not sure I can comfortably go with this problem looming over us. As Americans we have expectations that things will happen in a timely manner. Africa is a continual lesson in patience for me. I often think that I’m not a very good student. Lori and Kelly are playing scrabble with Andy in the other room. I’ll go join them. Moon the cat pays a visit to our sewing room. Today we woke up in Chituka and are now back in Mtunthama getting ready to go to sleep. It’s been a long day, mostly one of travel. It’s nice to be back here and the best part is that Chrissy’s baby has been born and is here. Erika came into the world on Saturday, so we are now living with a 3-day old child. While in Chituka, we met with a group of women and taught the menstrual management and reproductive health curriculum to them. It was fun talking to adults about this and hearing questions that we never get from schoolgirls. There were lots of concerns about getting pregnant, trying NOT to get pregnant, etc. We laughed about lots of the things that women everywhere always giggle about. We decided to give the school teachers in the group the supplies that we bought for the sewing guild that we had hoped to start. The teachers will work with schoolgirls to make our kits. 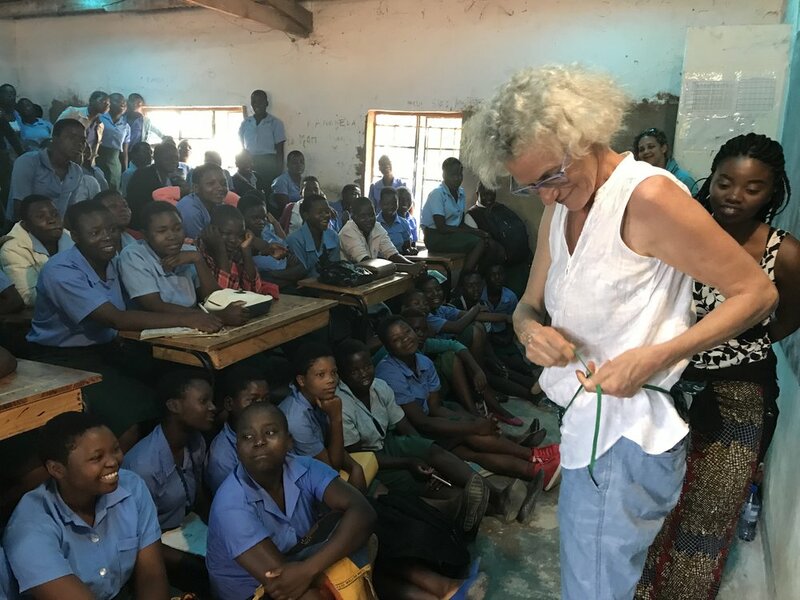 They already have a sewing class each month for the girls and these teachers now have first-hand experience on how to put the kit together. I think this is a good solution to our problem. We will give some supplies to Mzum too. She's the one woman who brought a machine with her. Mzum uses a wheelchair but when she sews she gets down onto the floor and uses a hand cranked machine. She will try to get her sewing friends to help her make the kits we have given her and to see if she can get a guild off the ground. At the end of the session we were presented with the traditional pieces of fabric that are worn tied around one’s waist. It’s called a chenjwe. There were plenty of photos taken of us in our new finery. Once the group dispersed we divided the kit supplies between the school teachers and Mzum. After heartfelt goodbyes, we got into Peter’s car (the magnificent driver we found in Chituka) and headed for Kasunga. It took us seven and a half hours to get back. We were stopped 9 times by the police and passed through another 3 police stops without incident. I must say the drive was spectacular. The mountains, rubber tree plantations, deep dark woods and stone outcroppings were amazing and made the drive go by quickly. We had dinner this evening with Peter. Kelly loved listening to me talk with him about periods while he blushed and laughed. He is a dear and we would certainly ask for his help again. I’m beat and must go to bed. We walked on the beach tonight. The rain had stopped, the sun was out, and it was impossible to tell the difference between this lake and the ocean. This morning we had watched cows running down the beach with little boys running behind them. Kelly took a wonderful picture (below) that gives you a small sense of just how magical the Malawian landscape can be. We met our group of women at 9:00 am. We told them to meet us at 8:00 but trusted that Malawi time really meant closer to 9:00 and we were right. We all carried chairs (on our heads) over to the meeting place and continued the sewing that we had started the day before. When each woman finished her kit, we had her cut fleece pads until everyone got the experience and we ended up with enough pieces for everyone to take three home. We ended the day with photos of the group holding their kits and of course a prayer, which is how we start and end each session. It’s all said in Tonga and I haven’t a clue what we are praying about. It sounds cool and feels right so I go with it. Tomorrow we leave here for Kusunga and then Mtuntama after teaching our menstrual management and reproductive health class. It almost feels like going home in an odd sort of way. Jen Hardy will be there when we get back. She’s the women I met last year and lived with for a week. It will be so nice to see her. Chituka, Malawi! 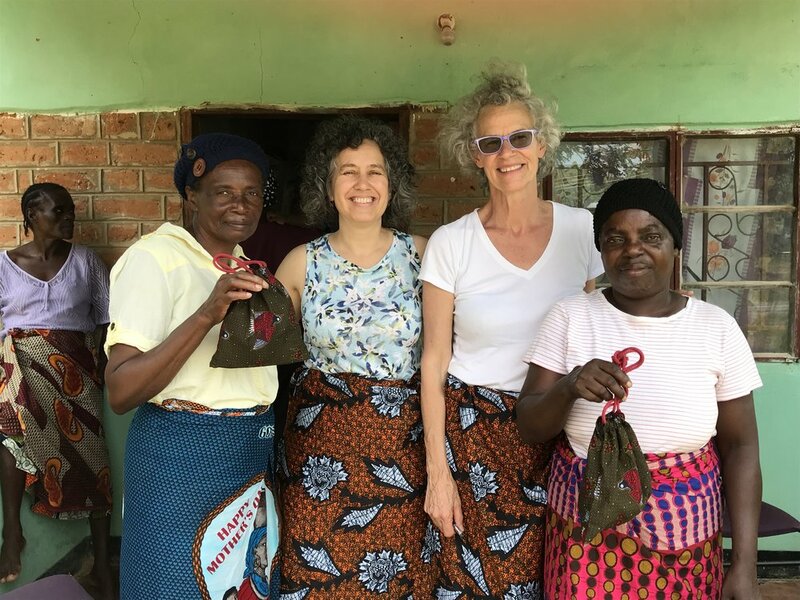 After a breakfast of black Malawian tea, beans, an omelette and toast we went to meet 20 women who were excited about sewing MoonCatcher kits for themselves. One woman arrived with her sewing machine, but the rest received needles to make hand-stitched kits. We worked in a church where half of the floor was finished concrete and the other half still red dirt. Everyone helped carry chairs and tables from Naymoti’s house. Sunshine poured in through the window shaped openings, so the light worked well for most of the day. A Malawian MoonBee was born. The difference was that we worked all day long today instead of the usual 2 hours. I was totally beat, but we had a wonderful experience and felt pretty productive. We’ll go back tomorrow and finish the sewing and then cut the fleece for the pads. By day’s end I’ll bet we can take pictures of everyone holding up their completed kits. We’ll try to send copies back to the women with Keni when he comes here in May or June. I’m not sure if we’ll be able to form a sewing guild here. These women only hand sew and that will be too time consuming in terms of production. Machines are needed and even more importantly we’d need women who can use them. I’ll need to keep thinking about this for the next day or so and decide what can be done. I love hearing the waves lapping against the shore. It’s a pretty place. Off to read my book for a bit and drift off to sleep. So much has happened in the last few days that has prevented me from writing this blog. Let me try to recap. We spent Wednesday morning working with teachers in areas surrounding Mtunthama. 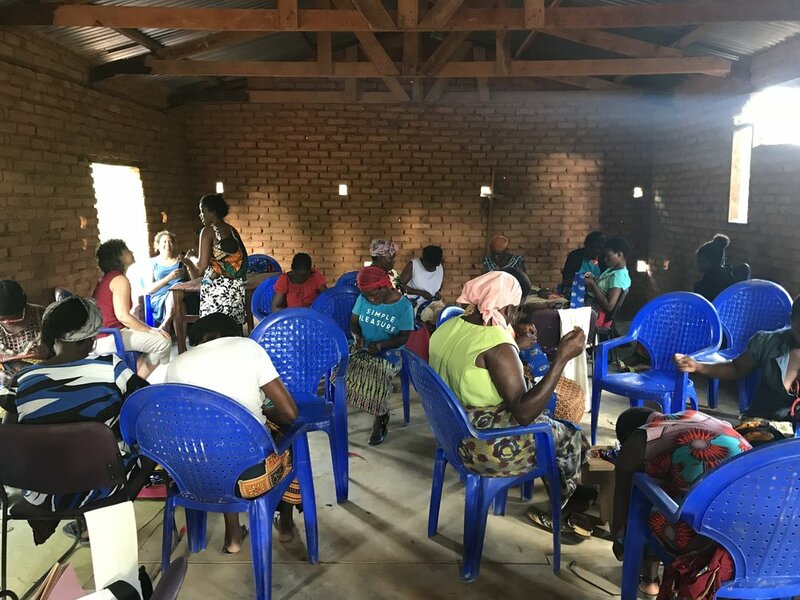 There were about twenty-five of them that had come to hear about The MoonCatcher Project and talk with us about the plight of girls in Malawi. It was an interesting conversation and I was able to ask for help in teaching the curriculum and talking openly about menstruation. We left for Lilongwe soon after meeting with the teachers. What would normally be a two-hour trip took four and a half hours. We rode the local mini bus driven by a man who drove back and forth along the roads looking for passengers to fill or perhaps I should say “over fill” his vehicle. It seemed he stopped every two feet to pick up or drop off someone, put gasoline in the car (from a large plastic bottle), talk to his friends or get stopped by the police. We couldn’t believe it and started to laugh every time one of these things happened. It was crowded, dirty and loud. It was quite an experience, but I may not feel the need to repeat it. By the time we reached town there was about a half an hour of shopping time left since all the fabric and sewing supply shops close at 5:00. In Lilongwe that first day, we found African fabric but that’s as much as we were able to accomplish. We decided to go talk with Emily, the woman who would take us to our Northern destination of Chituka Village, about our time schedule the following day. 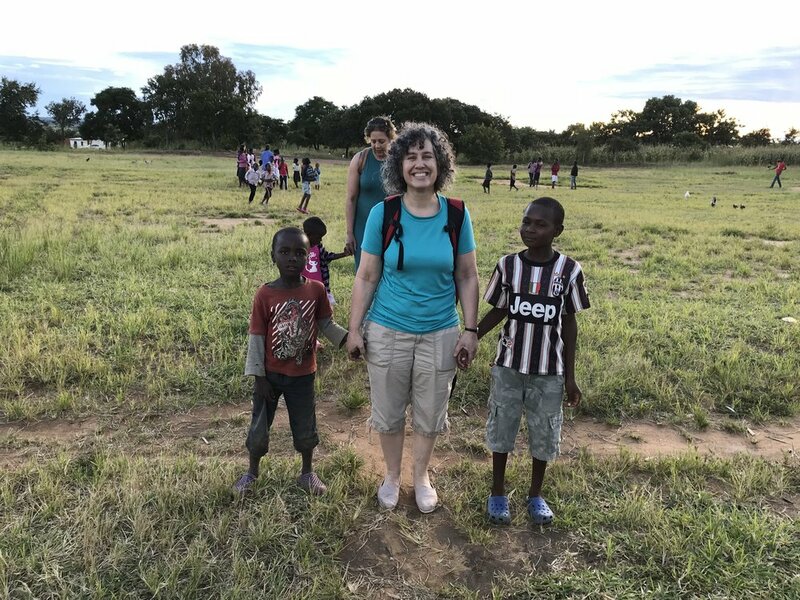 During the conversation we discovered that Emily expected to take a road to Chituka that did not go near Kusungu which is where all the supplies for Chituka were packed and ready for us to pick up. Because of this our sweet driver, Mary’s longtime friend, Yvonne, and her boyfriend took Mary and me all the way back to Mtunthama to collect those supplies in the middle of the night. God bless these kind souls. We got back to Mary’s house at 2:00 am, slept and were ready to try shopping again by 7:00 am. I laugh about this now, but it seemed impossible to find out that we had a flat tire and needed to deal with that before we could get into town. Somewhere around 10:30 am this problem was solved and once again we were pressed for time to get everything accomplished. Emily expected us at 12:00 noon to leave for Chituka. We squealed into Emily’s driveway forty minutes late. It was pouring rain and we hadn’t really finished buying what we needed. Oh well! Our MoonCatcher mantra, “Go with the flow”, has been repeated over and over by all of us. We had decided to make do somehow, when the whole schedule changed again. Welcome to Africa time! We ended up leaving the next day, were able to go back to collect more of the items on our shopping list and go out for a nice dinner (with wine) courtesy of my husband who had given me some money for my birthday to spend doing something special here. We took Yvonne with us and really did relax and enjoy ourselves. Four friends laughing about our adventures. These days I have slept like a rock and have woken to the sound of Lake Malawi. These are ocean sounds from an enormous lake. It’s lovely! Yesterday in Chituka we were greeted by song and dance. 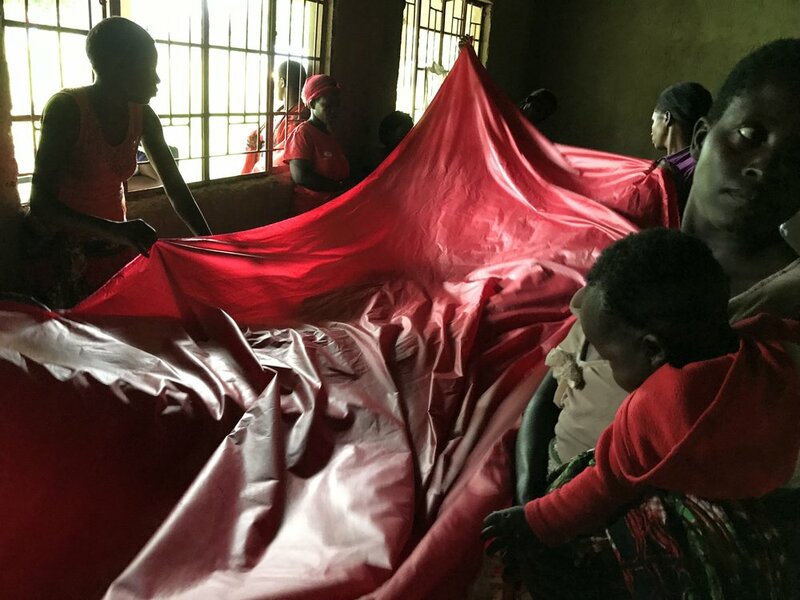 Twenty-seven women had assembled to learn how to make our kit. We talked about and demonstrated how to wear our pad. We cut waterproof fabric and when it became too dark to see we said goodbye until tomorrow. Busy day at our sewing guild with our tailors for The MoonCatcher Project. We are still fixing some of the pads that had been made before we got here. We were visited by other volunteers on and off all day long. It was fun to see the sewing room filled with women working and talking together. Our translator, Mary, showed up and was instantly helpful and loved by everyone. Mary helped us negotiate our conversations with Esme, Sophie and Elizabeth as we showed them what needed to be changed on the pads. She also worked out the logistics for our trip to Lilongwe and up north to Keni’s village as well. We will leave for Lilongwe tomorrow and spend the night with Mary at her family’s house. Emily has invited us to her house for dinner so we will have a chance to speak with her and learn more about the people we are going to be working with in Chituka village. The following day we’ll shop in Lilongwe and then head for the village. I imagine it will be a full and very long day. We managed to get quite a few completed kits together today and the ladies will continue the work for the next two days while we are away. I hope to come back to work that has improved a great deal. These poor women had to listen to me ask them over and over to redo things. I want the kits to look beautiful and feel this won’t happen if it isn’t understood how to attend to the details. At the end of the day, we delivered Lori’s books to the orphanage. The older teenage kids loved being able to get books especially one boy who ask if she had novels. When he heard that she did he was so excited and walked away with a stack of stories. Kelly read picture books to the little kids who crowded around her, pressing in to see each page. Can’t wait for a nice warm basin bath and then off to bed. I forgot to mention that we had nsima tonight, the favored food of Malawi made with maize and eaten with one’s hands. FUN! The day started with grey skies, turned to rain and then became fairly sunny. A perfectly lovely Malawian day! We met Jacque at 10:00 at K2 Taso the HIV/Aids health center that Peter and Jacque started several years ago. The MoonCatcher Project is housed in one of the outbuildings known as Cindy’s house (named after Dr. Brian Lisse’s wife). It’s wonderful to have a room just for the tailors with a sign saying this on the door. There are outlets so eventually we will have electricity to run the sewing machines. 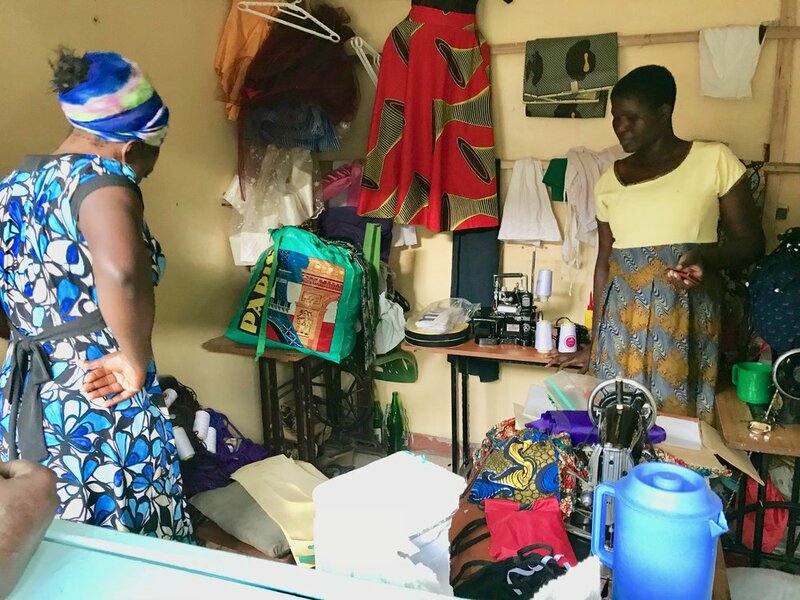 Now we use only treadle machines and are hoping to buy one more in Lilongwe this week so that we can keep three women sewing at a time. It was fun to find 300 MoonCatcher kits on the tables in the new sewing room. It always amazes me that this project has grown so much and is in so many countries. On close inspection of the kits I found some problems that we set about correcting. Esme, Sophie and Elizabeth are new tailors. Phoebe and I taught them last year to use the machines and put together our kit. Sewing takes time to master and it’s incredible that these women have progressed as well as they have. We spent the day talking about the problems and figuring out how to make changes. We found shoelaces that had been bought too short to go around a waist but after removing the elastic sewn to each one we are able to use them for drawstrings for our carry all bag. The fleece that was cut too narrow has been sewn to another piece to create a pad that is the right size. Tomorrow we’ll turn some of the waterproof bags to the other side so that the rubberized material will be on the inside. I’ve only taken a quick look at the carriers and some of them need to be repaired but we will figure this out. 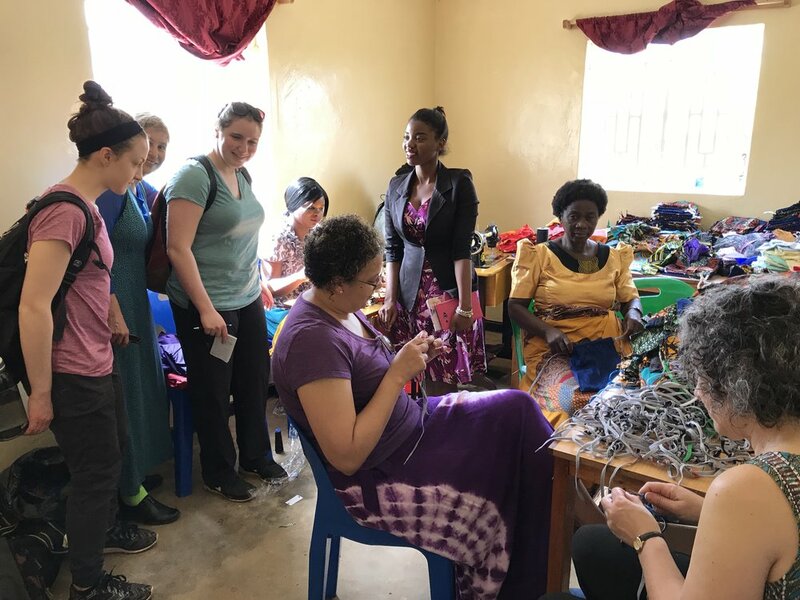 This kit isn’t easy to make but I know these women will get it right and the project will thrive.We stopped work at 5:00 and went with Elizabeth to visit her orphanage. There are 82 kids there ranging from seven weeks to twenty-one years old. Some have only one parent (mothers often die in childbirth); some have none having lost both parents to HIV/AIDS. As we walked to the building we found little sweaty hands reaching to hold ours and before long we felt like pied pipers with crowds of little ones following us. Inside Kelly and I picked up infants loving the feeling of holding these sweet babies while they stared and smiled at us. No, I’m not coming home with a baby, but I can see why it would be tempting. Kelly and her new friends. Lori as we head toward the orphanage. Back at Andy and Alice’s house we found hot tea and popcorn. Made me think of my father-in-law who loved popcorn more than any other food. Here’s to you Norm! Kelly asked me what the lessons of the day are. Wow! I guess for me it’s always a lesson about patience and compassion. I don’t like having to tell someone that something is wrong and having to correct the sewing all day was hard for me. I knew it had to be done in order to make a beautiful product both for the schoolgirls and for the pride of the tailors. I hope I was kind and gentle about this. We’re here! 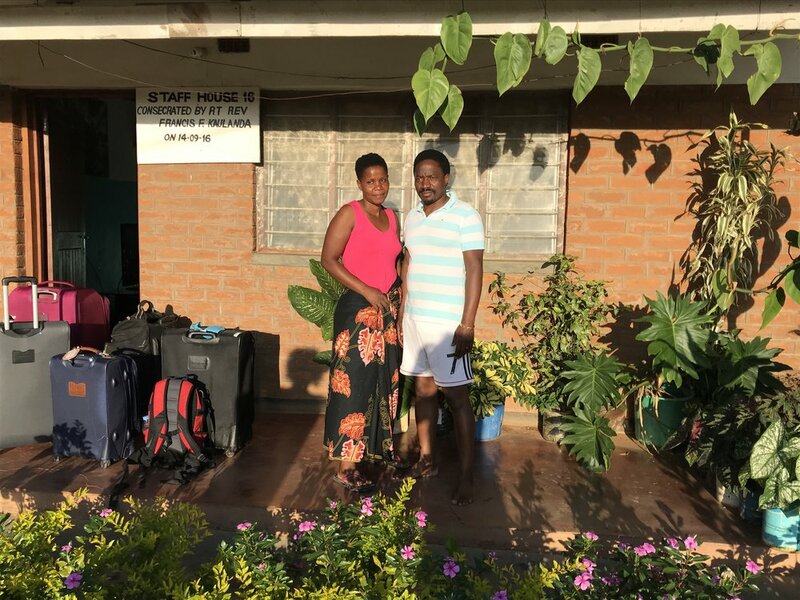 After two days of cars, airplanes and vans we are settling in with my last year’s host family, Alice and Andy in St. Andrews Hospital compound in Mtunthama. There are twenty of us. 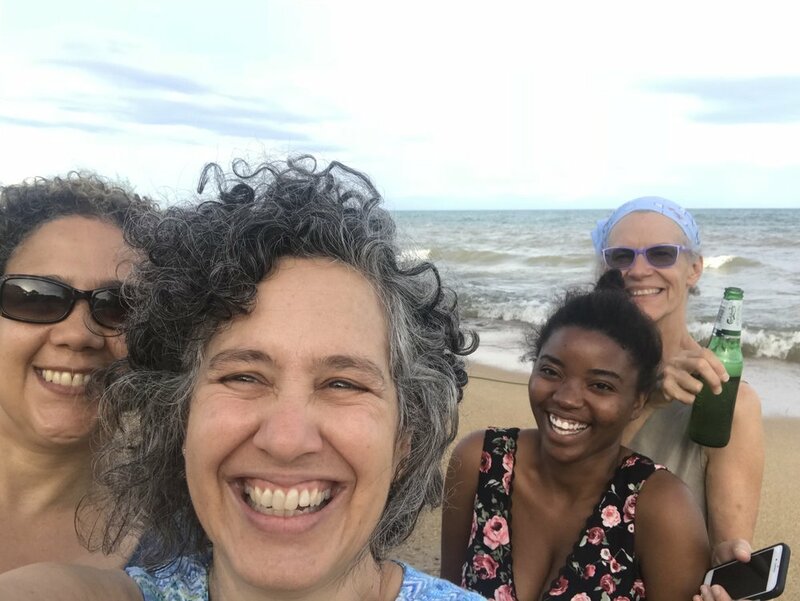 The group is made up of high school students, medical experts and just plain interested folks who want to do some service work in beautiful Malawi. My friend Kelly de la Rocha and her best friend and college roommate Lori Ludlow have joined me to do the MoonCatcher part of this trip. Kelly has been wanting to do this for years and finally found time to come. Kelly is a journalist (she used to write for the Schenectady Gazette) and Lori is a Librarian on Long Island. I am so pleased to have them along for this adventure. I was met at the Lilongwe airport by Emily Phiri and Mary Khunbanyiwa. Emily is from Chituka Village where we will be working later in the trip. Mary, a charming and savvy Malawian has agreed to help with logistics and translations. They had come to say welcome and to meet me face to face. I was so touched by this generous gesture. The countryside is as beautiful as I remember with those lush trees covered with yellow blossoms and skies that go on forever with magnificent big billowing clouds. The extinct volcanos rise out of the ground right in the middle of vast open fields and seem unworldly sitting there all alone. It is good to be here to check in on our tailors and expand their work. We’ll see them tomorrow and see what needs to be done. I’m so happy to have Kelly and Lori here. I believe we will be a good team. I’m sitting in the Brussels airport waiting for my next flight, which will take me to DC. I’ve been without Internet for a couple of days so I’ll try to recap my last adventures here. 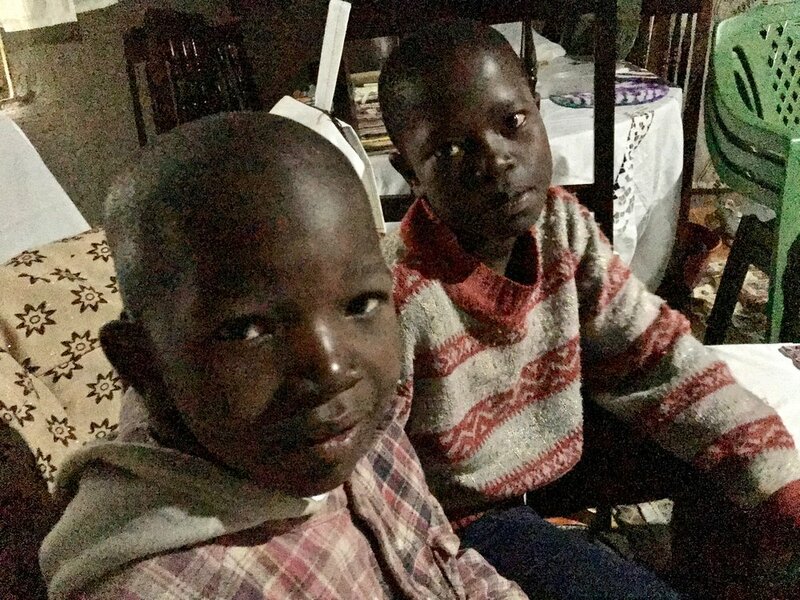 It took us 13 plus hours to drive from Nairobi, Kenya to Jinja, Uganda the other night. Yep, we got lost and there are almost no roads signs anywhere so we stopped often to ask directions which took us on many back roads, most of which were pot holed and took hours to navigate. The good part was that we ended up in tea plantations planted on the sides of steep hills. These fields look like checkerboards of bright green. There are narrow paths running vertically and horizontally throughout so that people can walk and work with the plants. I have an image engraved in my mind of a little boy skipping down one of those paths with his arms waving above him. It looked like pure joy to me. We wouldn’t have seen any of this if we’d taken the “right” route. We never did find fleece in Nairobi or many of the other things we had hoped to source but we learned a lot and will do it differently next time. Yesterday, my last day in Uganda, was suppose to be our day off. Phoebe and I had imagined a slow, do-nothing day but boy were we wrong. The cool thing is that neither of us ever felt rushed. The day unfolded with astonishing experiences landing in our lap with no effort at all. We joked that perhaps this extreme planning thing is for the birds. Our dear driver, Yasin, came to say goodbye and while doing so he mentioned that the woman in his car that he was taking to a meeting also makes reusable menstrual pads. (Really, what are the chances!) So we had to talk with her. She was delightful, shared all sorts of information and exchanged contact info with us. 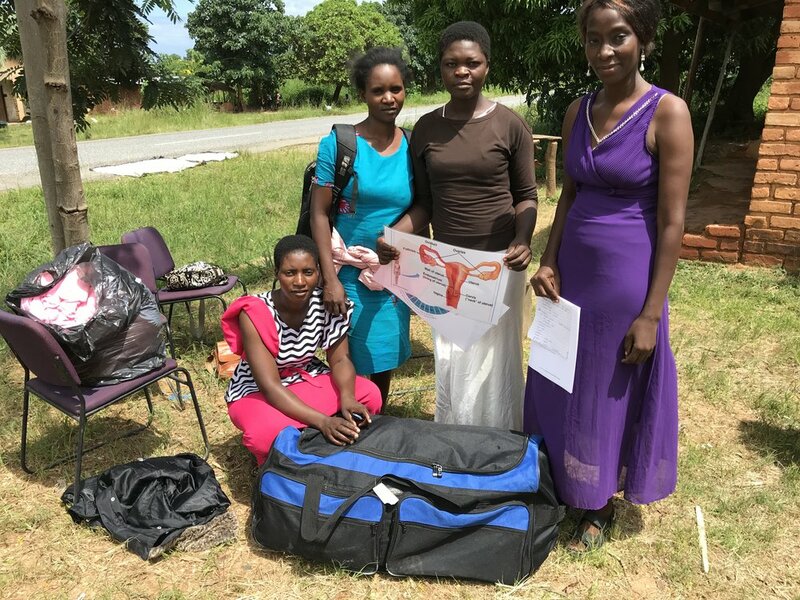 Phoebe will go to an International Menstrual Management meeting with her and work on how we can partner in some other ways. She was so excited that our pads can be worn without underwear, which has been something she has been perplexed about. 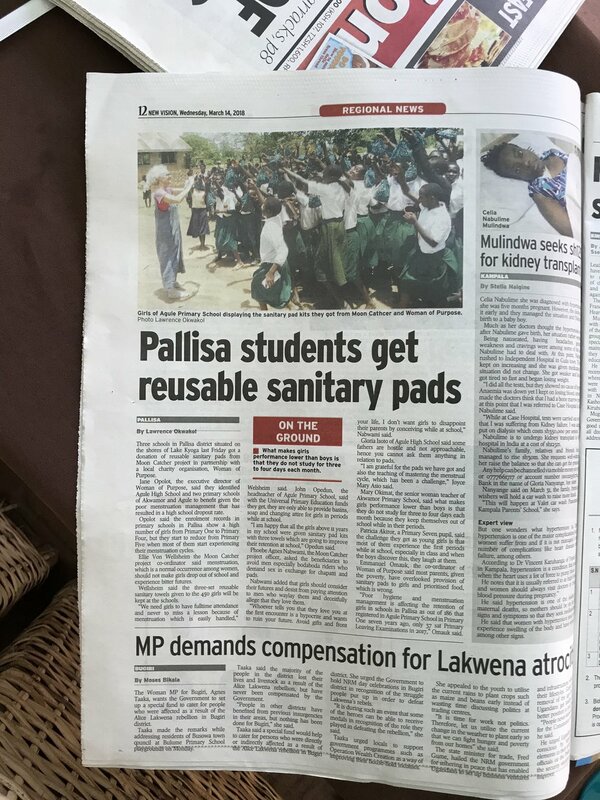 We next found out that the Newspaper story about our trip to Pallisa was in two papers that day so we bought several copies and headed for a just then confirmed meeting with a Rotary Club. We sat with several Rotarians who were so excited about our project and want to work with us to expand it in Uganda. They presented me with a fabric hanging with the Rotary emblem on it and took tons of pictures. I joked that I felt like a rock star with all the cameras aimed at me. I’ve been looking for a Ugandan Rotary Club for 4 years and this one looks to be perfect. By the way, when we showed up for that meeting our friends Jane, Emma and Juliet from Pallisa were there too. They wanted to tell the Rotarians how much they believe in The MoonCatcher Project. AND we had the newspaper articles to show them. Talk about synchronicity. This was unbelievable. Last but not least, Father Francis called to say he wanted to drive us to the airport. This not only gave me time with him but also relived Phoebe of more driving. On the way to Entebbe we stopped at his school there and saw the new bathrooms that we had discussed with him last year. With a couple of small tweaks they will be great for the girls. Dinner, repacking some things and dropping me at the airport ended the day. Thanks to Tony, my new ticket has been perfect and I’m on my way home. Good-bye and thank you Uganda! 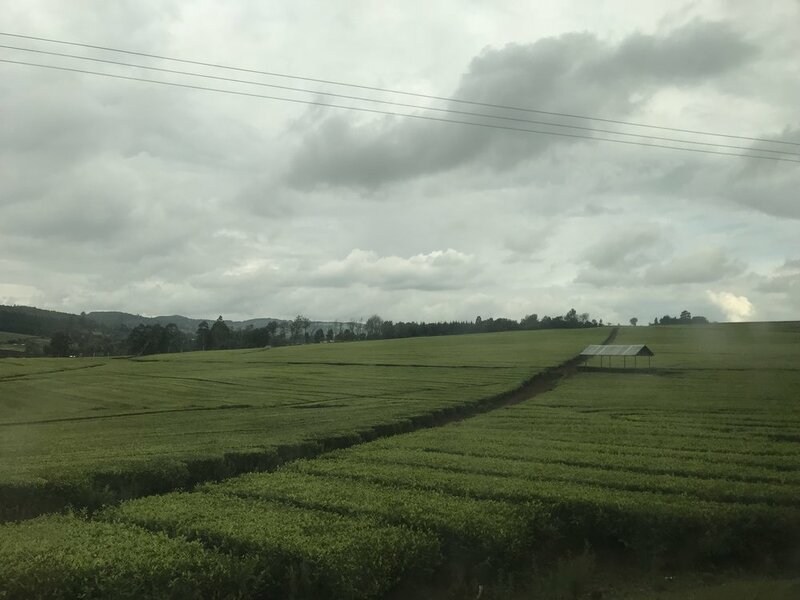 It takes six plus hours to drive from Kisumu to Nairobi through the most glorious landscape imaginable. The first part of the trip was flat as a pancake and we wondered how people dealt with all the rain that Kenya gets. Jackie says that some people just vacate their houses for the downpours. After a while it all becomes hilly and then mountainous. The trees keep changing with the different altitudes and I fell in love with one variety called something like Bongo Bongo. It’s darker than all the others and lifts numerous arms skyward as though talking to the heavens. Best of all we saw zebras, giraffe, antelope and camels in the wild. I declared the day a success right then and there and we hadn’t even gotten to Nairobi for our real business. Our hero of a driver Yasin was thrilled to see fancy cars on the road and would enthusiastically exclaim, “Look at that Chevrolet! That’s a nice ride”. His favorite was a sky blue Jaguar that we just went ahead and added to our list of animals, much to his amusement and perhaps dismay as well. We got to Nairobi later than we had hoped. Jackie couldn’t figure out where we were and her phone calls to her sister didn’t help much. We finally worked it out, ran into as many fabric shops as possible and got a few things taken care of. Tomorrow morning we’ll visit a place that we’ve been told has fleece after which we’ll leave to drive back to Uganda. We ate dinner at our hotel and laughed as our meals were completely mixed up. I got Jackie’s Matoki and Yasin got my Ugali. Phoebe got garlic tea instead of ginger and Jackie got roast chicken as well as another friend’s fried chicken. It was crazy but we sorted it out and added it to another wonderful day to remember and giggle about. We left Uganda this morning for our trip to Kenya. The drive was really beautiful with lots of changing landscape and plenty of people and small towns along the way. It took a while to get over the border because of the supplies we brought to Jackie. We got taxed for all of it and charged for Kenyan insurance too. Oh well! 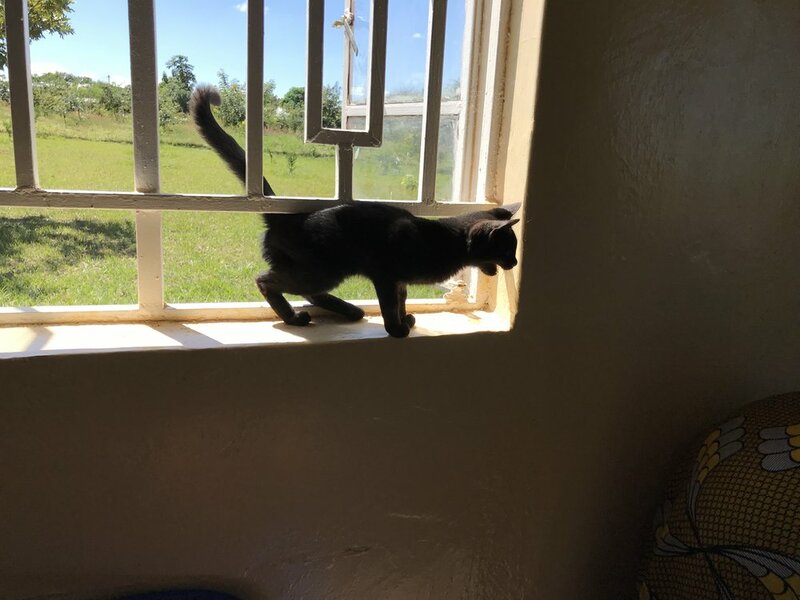 Jackie is the “Phoebe” of Kenya. She is a bold, enthusiastic and charming woman with lots of energy. She supports three children, all boys, and has taken in a neighborhood girl who has lost both of her parents. I find her delightful. We went to see the sewing cooperative that she has started. It’s in a row of other little shops and as we visited with Jackie people stopped by to say hello and express welcome to us. It’s a busy friendly place. After seeing the sewing shop we were invited to Jackie’s home. I’m always interested in how other people live so was excited to accept this invitation. Jackie and her boys little in a sweet little house nestled in amongst others in a small village. We sat in her living room as rain came thundering down so loud on the tin roof that we really couldn’t talk for most of the time. That was ok though because Jackie handed us her wedding album to go through and her little boys pointed at pictures of themselves and their mother. Pretty cute. When the rain let up we headed back to Kisumu, got stuck in the mud twice, pushed the car out and got back to our hotel for dinner and an early night. No water in the shower but a bit in the sink so that will have to do. Kenya is more developed in many ways. It has beautiful mountains and rolling terrain. We could see lake Victoria from the road now and then. The vegetation feels different from Uganda in some ways and the houses look more modern.